The underwater dolphin kick can help propel you faster during a race. When you push off the wall in a race, flip-turn between laps, or dive off the block at the start of a race, you're allowed to perform underwater kicks, also known as the dolphin kick. This is the same kick used in the butterfly stroke. These kicks prevent a loss of speed generated, as remaining submerged means there is less friction as you glide underwater, thereby propelling you forward and maximizing speed. Learn how to perfect the underwater kick, and you'll be able to help increase your swim times. Just like when you take your stroke, your body should be parallel to the bottom of the pool as you kick off the wall or dive into the water. Lean and streamlined is the name of the game -- keep your toes out behind you, your legs together and your hands straight out in front of you, with your head down. Arch your back, shoulders and glutes toward the surface of the water while you bend your knees. At the same time, your arms and hands should remain straight and in front of your head. Your legs and core are going to do all of the work, so your head and arms need to stay sloped downward to keep you from floating to the surface. Use the dolphin kick to propel you forward like a wave, through your back and legs. Your hips should go down, thrusting into the water until your body is parallel. This must happen in a continuous and fluid motion for the kick to gain momentum. Your lower back should go from arched to flat to its inverse as you use your core to help stabilize your hips. The fluid wave that happens from the chest will only increase in amplitude, down to your toes, as long as you continue through the kick without stopping. You're at the end of the lap and are about to reach the wall -- that's when the underwater kick will happen all over again. 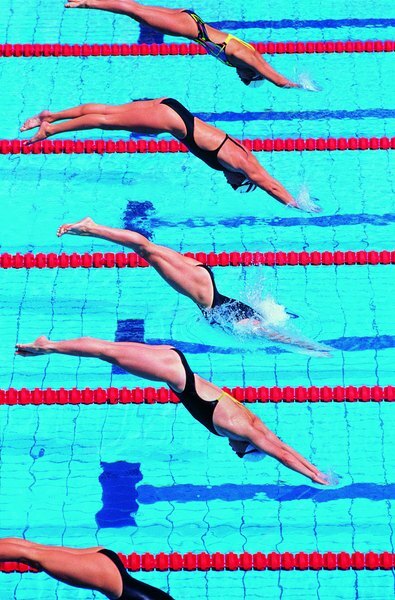 According to the Federation Internationale de Natation (FINA), which is the world's governing body of swimming, you can only swim this underwater kick for the first 15 meters after a start or turn. As you kick off the wall, remember to keep the knees bent and bring up the legs quickly to generate the most power.